Many are the stories connecting saints and animals. A number were gathered in a 1934 book (recently republished) entitled Beasts and Saints by that exceptional chronicler and popularizer of early Christianity, Helen Waddell. This fascinating work focuses on tales from the Desert Fathers, early western Christendom, and Ireland. The accounts seem to be primarily of two types. In the first, the godly man or woman restores an animal for the sake of human "owners," or recruits the beast for worthy human service, though in a way that exemplifies concern for both. 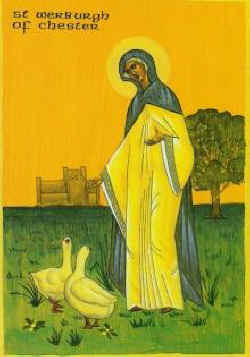 In the second type, the saint acts out of compassion towards animals for their own sake, in the process often protecting them from less aware humans. Readers of The Peaceable Table may, however, be especially engaged by stories of the second category, compassion for animals for their own sake. Similar to the plot of Malo's story is the following about Werburga (7th century), nun and daughter of Wulfhere, monarch of Mercia, a kingdom in what is now central England. Her uncle Ethelred, when he in turn became king, gave the pious princess an estate near the palace and put her in charge of a group of convents. One day her steward complained to Werburga that wild geese were destroying her crops. The royal lady told him in turn to put them all inside one of the buildings. Though puzzled, after some demurral he complied; without more ado the miscreant birds bent their necks and obeyed the saint's command conveyed through the steward. Werburga then came herself to instruct the geese to leave others' goods alone, and told them if they would promise to do so, they could fly off. To her surprise they refused to leave, but just circled her feet disconsolately, complaining as best they could. Finally it was divinely revealed to Werburga this was because one of their tribe was missing, and they would not leave without him; and furthermore, that the loss was because the steward had underhandedly abducted that particular goose for his dinner. Many remarkable encounters of saints and animals, of course, fall outside the historical limits Waddell chose for this particular volume. We will not do more than mention the much-beloved Francis of Assisi here, since his stories are well known. Notice should be made, however, of two representative luminaries of the Eastern church. Isaac the Syrian (fl. c. 700 C.E.) was a great exemplar of the ascetic tradition at its very best: disciplined, simple living not for its own sake or the sake of personal merit, but to free oneself for service; simple living as a way of opening one's heart to all one's fellow beings by means of an unencumbered life, able to look outward because there is so little in one's hand. 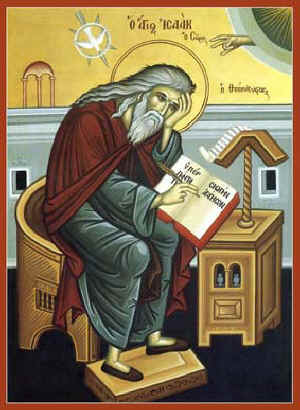 St. Isaac was once made bishop of Nineveh, but finding the burdens of office too cumbersome, resigned after only five months to become a hermit, devoting himself to scholarship and writing. His essays are still with us. His real vocation was teaching the spiritual way of the merciful heart, the path of a heart afire for all God's sons and daughters: for people, birds, animals, even demons -- for all high and low under heaven. The Syrian said that upon remembering these our fellow beings, or in looking at them, the wayfarer of the merciful heart would shed tears, for she or he would share in her own heart all the sufferings endured by other creatures. That is why, he explained, he was continually praying on behalf of irrational animals. "Poor innocent little creatures," he said to animals bound for slaughter, "if you were reasoning beings and could speak you would curse us. For we are the cause of your death, and what have you done to deserve it?" Further north and a thousand-plus years later in time, Seraphim of Sarov (1759-1833) surely represented at its zenith the gentle wisdom and light-filled mysticism of the Russian church. After a preparatory period of some twenty-five years as a forest hermit, Seraphim emerged to become a busy Staretz or spiritual mentor to prince and peasant alike. His counsel seemed miraculously perceptive as to individual cases, and his countenance was reported sometimes (one account is first-hand) to shine like a second sun. During his years of forest-dwelling, Seraphim acquired a particular rapport with animals. He was seen gamboling with a great bear as with a friendly dog, and when he went up to the monastery to take his rations, his animal friends, foxes, hares, and wolves as well as bears, would wait for his return, knowing he would share whatever he had with them. 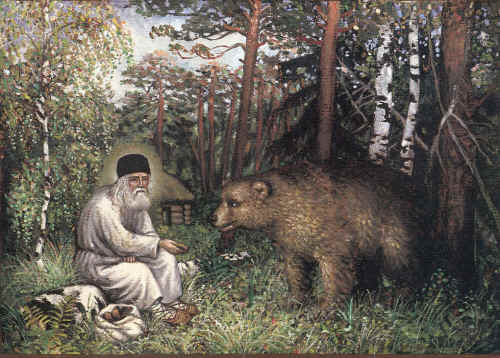 One day a nun, Matrona, of a nearby convent that Seraphim befriended, saw him sitting on a log with a bear. Terrified, the woman let out a scream, and the monk gently dismissed the animal and invited the sister to sit beside him. But, she reported later, the beast returned and lay at the holy man's feet. She was again alarmed, but "saw Father Seraphim, quite unconcerned, treating the bear like a lamb, stroking him and giving him some bread." The nun calmed down, then "looked at the father and was dazzled by the sight of his face which seemed to me full of light and like an angel's. When I was wholly reassured the Staretz gave me a piece of bread and said: 'You needn't be the least afraid of him, he won't hurt you.' So I held out the bread to the bear and, while he was eating it, it was such joy to be feeding him that I wanted to go on doing so." Seraphim characteristically told Matrona not to tell anyone about the incident until eleven years after his death. (Valentine Zander, St. Seraphim of Sarov, p. 61.) See also Seraphim in PT 30. 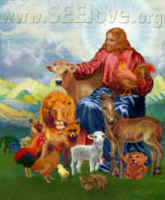 The relation of holy persons to animals is not limited to Christianity, Eastern or Western. The Yoga Sutras of Patanjali, basic text of yogic discipline and philosophy, perhaps roughly contemporary with early Christianity in their present form, instruct the practitioner to practice ahimsa, "harmlessness." This is one of the yamas, or abstentions, basic to the spiritual life; yoga rightly understands that unless one's life has a firm moral and ethical foundation, more advanced practice is worthless or worse. Of ahimsa the text says, "When a man becomes steadfast in his abstention from harming others, then all living creatures will cease to feel enmity in his presence." Many are the stories of yogis sporting with tigers, as did Seraphim with the Russian bear. 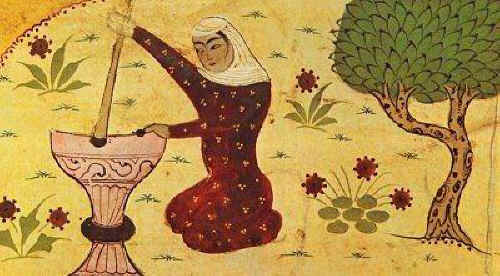 Turning to Islam, we may mention Rabi'a (713-801 C. E.), the former slave girl of Basra (now in southern Iraq) who became one of the first and most beloved adepts of the great Islamic poetic/mystical tradition. Purportedly, in the Islam of her day there was much emphasis on the Judgment, with its alternative destinations of hell and paradise. But Rabi'a felt that both were beside the point. She was said to have prayed "O my Lord, if I worship Thee from fear of Hell, burn me in Hell, and if I worship Thee from hope of Paradise, exclude me thence, but if I worship Thee for Thine own sake, then withhold not from me Thine Eternal Beauty." How are we to understand these stories of saints who clearly loved animals, and around whom birds of the air and beasts of the field gathered as though to be near someone wise and wonderful descended into their midst, those in whose presence even the much-feared predators are mild and harmless? Although some of the tales are legendary, their very existence tells us much about the spiritual vision of transforming power and ultimate Peace that they represent; while others of them, in fact, appear to have considerable historical truth. We are therefore justified in taking them seriously and seeking their meaning. First, through this kinship with animals these blessed lives exemplified Oneness, recognition of the ultimate oneness of God, of ourselves with God, and so of all beings with God and with oneself. It is unity in diversity, to be sure, for this unity does not force, but engages each sub-center of consciousness in that creature's own way, seeking to live oneness through means suitable to his or her own way of life. Second, the saint therefore recognizes in practice the supremacy of love and compassion as the high virtue, for love is an energy always striving toward oneness, yet without compulsion and with full respect for diversity. It cherishes that which is different in the other, as revealing another facet of the One that we love. The animal-loving saint, then, knows and lives out holiness as a quality indivisible, which opens one up, so to speak, to the inner holiness, or potential inner holiness, of all beings out to infinity. That is a magnificent understanding, one that sees the Divine shining the eyes of our animal kin. It is the first step on a marvelous pilgrimage.